Vanilla Granola. That is not what this is. Sort of. Just keep that in mind OK? I think store bought granola is kind of a rip-off. The box should be cereal sized but it isn't. You eat it twice and behold! Your tiny box of granola is empty. Thankfully, It turns out granola is easy to make! Not only is it easy to make but munchkin's like it too. The Munchkin tells us he wants "o-gurt and banilla". This translates to "yogurt and granola". But because his favorite yogurt is vanilla, we usually end up in a who's on first discussion. (Banilla Vanilla is not pictured here). It took us a bit, but now we know o-gurt and banilla means vanilla yogurt with granola. We are now practicing how to say "granola". I like to call this Everyday Granola, because once you make it, you're going to eat it everyday until it's gone. Then repeat. 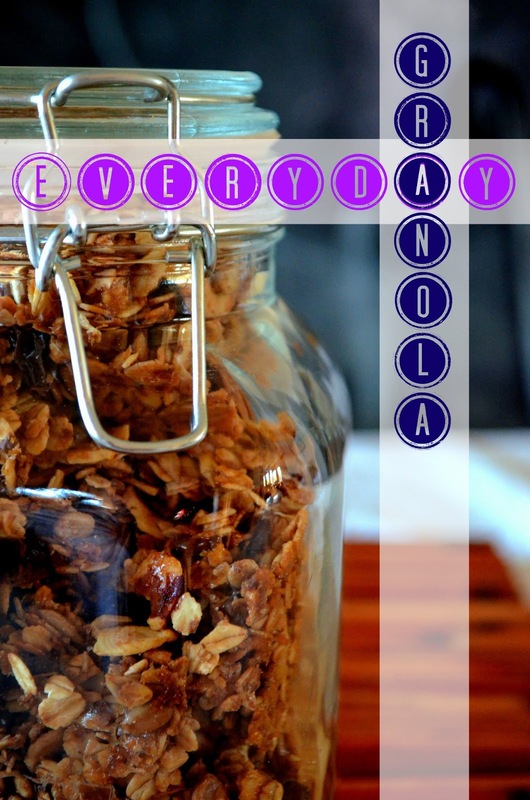 This banilla granola is good with yogurt, but also on oatmeal, with milk, or just plain! This granola recipe was inspired by this. 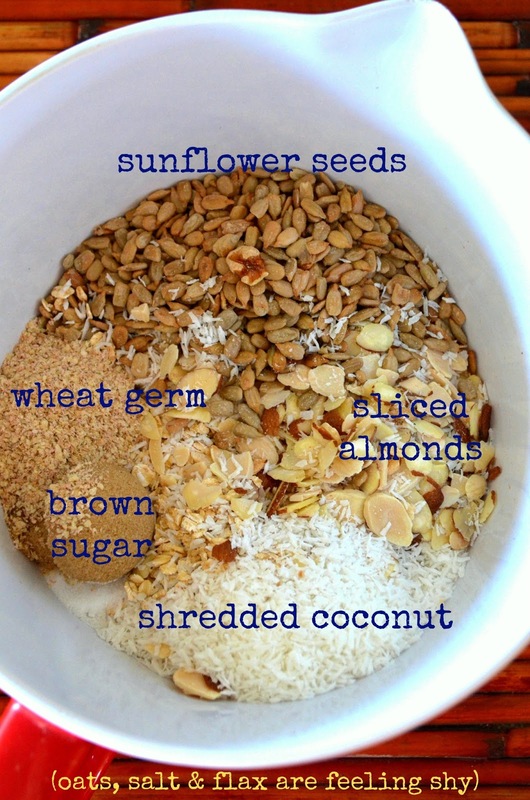 Add dry ingredients in a large bowl and mix well. Melt together the wet ingredients using a microwave or a pot (we don't have a microwave so I do it on the stove), mix well. Once melted, pour the wet mixture over the dry mixture and mix well. Spray a large baking sheet with nonstick spray. 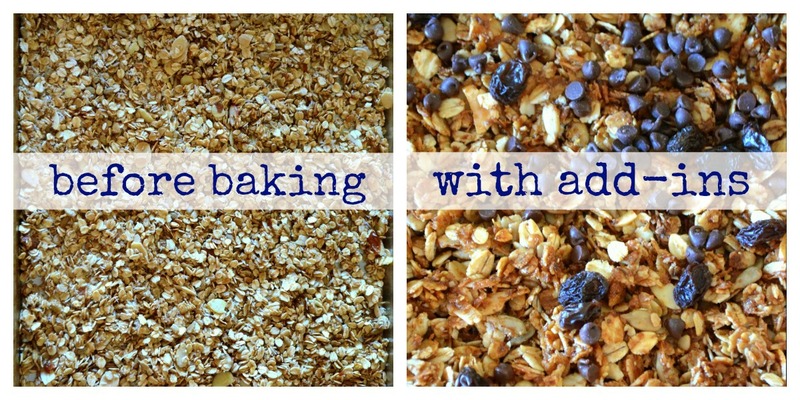 Spread granola mixture in a layer over the entire sheet. Bake for 15 minutes, then stir/flip with a spatula. Return to the oven and bake 15 to 20 minutes more until light golden. Stir while cooling based on how chunky you like your granola - if you like bigger chunks, don't stir it a lot (just remember you've got to transfer it to a container). I store mine in the jar shown above, I believe it is airtight, but we eat the granola so fast it probably doesn't matter! If you like this granola recipe you might like this one too. Enjoy your o-gurt and banilla! I've been making my own salad dressing lately. Not only is it much cheaper than buying bottles from the grocery, it tastes better and has less "junk" in it. Usually my standard fare is olive oil with balsamic, a bit of brown mustard and brown sugar - or - olive oil with Meyer lemon juice and salt. Both good and easy to make. But when I came across this recipe from skinnytaste I knew I wanted to try it out. If you eat sushi or Japanese food, you'll recognize the flavor of this dressing as soon as you taste it - so good! - and a nice change to a standard dressing. There are lots of carrots at the farmer's market right now, so this is a great alternative use for them. 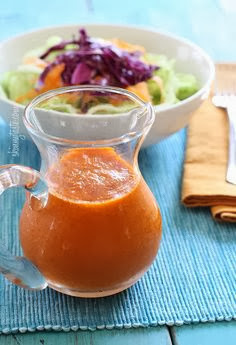 So, spice up your salad with this dressing and enjoy something new and tasty! It's only fair to say that Elizabeth Gilbert also authored one of my favorite books of all time Eat, Pray, Love . I found The Last American Man after listening to an intriguing episode of This American Life, which I now cannot find. The podcast discussed the books main character, Eustace Conway and his record setting horseback ride across the United States. What was presented in the podcast turns out to be the shiny version of the real story described in the book. Eustace Conway is such an interesting and just amazing person. I seriously wish I could meet him one day. 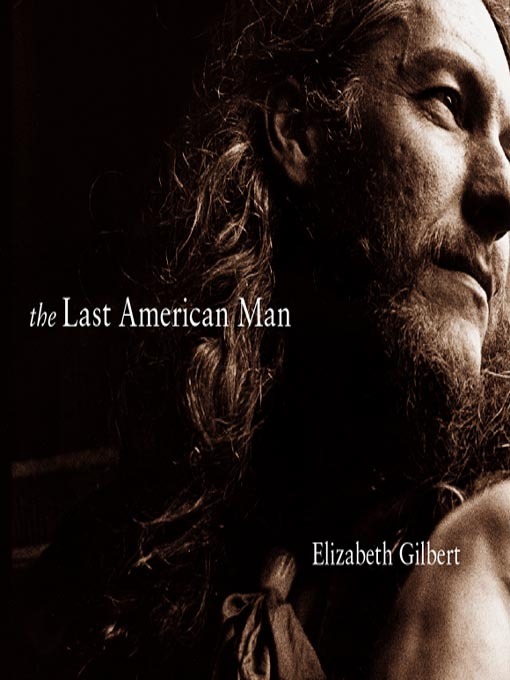 Elizabeth Gilbert, who is a friend of Eustace's manages to write about him in such a real, sometimes painful way. There is too much to share about Eustace Conway in this short review, but I feel like I should note that he has been living (truly living) off of the land since he was a teenager. The book is so full of information, history, environmental politics and points of view, but reads like a window into someone's living room. I don't typically read books like this (i.e. non-fiction) and I'd seen and heard about this book several times and continuously passed it by. I finally started reading it one evening when I'd run out of other books. It caught me from the first few pages. 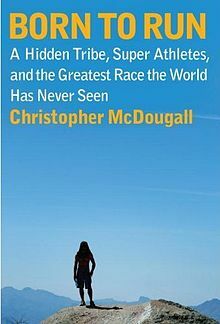 I really loved the story and the way Christopher McDougall told it. It was also so interesting to learn about the Tarahumara Indian tribe. The thoughts and style of the Tarahumara and Caballo Blanco turn any main-stream running theories on their head. If all of that wasn't enough, this book will totally inspire you to run. If I'm feeling tired when running now, I pretend I'm Tarahumaran. I also bought Chia seeds and I'm planning to attempt to make my own GU. In addition, I'm also now determined to teach myself to run in sandals. Seriously. I think the best way to describe this book is raw. After losing her mother at a very young age, Cheryl Strayed goes through an extremely difficult time in her life. 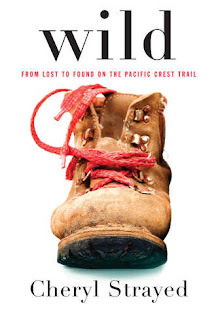 She decides to hike the Pacific Crest Trail (which runs from Mexico to Washington state) in order to find herself. Her journey, both physically and emotionally, is pretty amazing. The book is everything: funny, thrilling, scary, sad, painful, happy, joyous ..the list goes on. Most of all, I think it's incredibly brave for an author to write in such a revealing way, exposing every part of herself. I both admire and respect her for taking the journey and sharing it with the world. In other news: our house has been inspired by the PCT. Shortly I hope to share some exciting things with you. On this, Valentines Day, I bring you a list of things I'm lovin' lately. Now let's get our list on, shall we? Rent the Runway - Have you heard of this? I saw it on The Egg. The title of her post caught my eye "always a bride$maid". So. True. When clicked to her page (you should too) and saw the fabulous bridesmaid gowns in the photo I thought, holy...how much did those cost?! See what I mean? But then she reveals to us Rent the Runway. 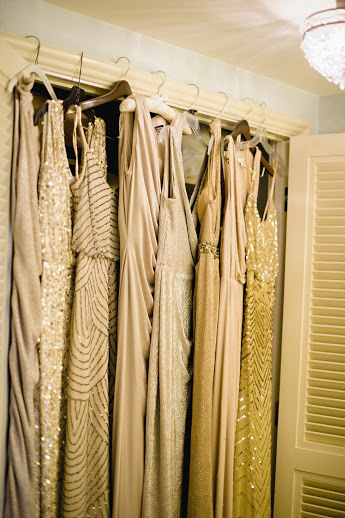 A nifty service where you can rent a designer dress for around $100. They mail it to you (I think it also includes a back-up size), you wear it, act fabulous and send it right on back. What a great idea!! Seriously, who wants to pay hundreds of dollars on a dress (that's not as great as a designer dress) to never wear it again? Brilliant I say. Just brilliant. Flipboard - I'm probably sounding like 1982 on this, but Flipboard (an app for your phone) is new to me and I'm totally loving it. I needed a good news app and my smart hubs recommended this one. It is extremely easy to use and flawless in its design. Salted Caramel Chocolate Chip Cookies by Two Peas & Their Pod - Yes, I have a bit of a salted caramel obsession. It started at Molly Moon's and it hasn't stopped since. What I really like to do is try to get other people to love salted caramel as much as I do. The Cyclist told me about 82 times how good these cookies were, so I think I have a convert. The Taste - Have you seen it yet? Here are my thoughts: Anthony Bourdain seems nicer than I thought he would be. I love that a lot of home chefs were chosen and are doing fairly well. It's cool/crazy/fair that judges can accidentally kick people off of their own team. I secretly want to be a contestant. My mom and I can't stand Diane, sheesh what a horrible attitude! Who am I rooting for? Well our hometown dude of course! Chef Adam Pechal who has a couple of restaurants here in Sacramento. I also like Sarah, the blogger who is apparently also a pyromaniac. Avocado on toast - Admittedly, I saw this on Shutterbean and thought it looked kind of weird. Then one day I tried it. Now I have it for breakfast almost everyday. It is so. freaking. good. Butter? What's that? Seriously, smash up some avocado, spread it on toast, be friendly with your salt and have breakfast, or a snack, or lunch. Via you should follow me on Instagram! Finding out I have Monday off - yeah, kind of rad. Three day weekend! Woot! My Husband - Yes, The Cyclist. That's him. He who loves me and who I love back. Who likes my food and my stupid jokes. Who says nice things and makes me smile. Who buys me a big girl camera and makes me cry tears of joy. Who I am proud of and hope he is proud of me. Who said I could do this to him as long as I used good pictures. Who is my best friend. Who is home. Ahh vacation. I love it, don't you? Since I don't have one scheduled until June, I am daydreaming of vacations past. Why don't you join me? In October my ridiculously awesome job took us on our yearly firm outing. You'll remember we previously went to Solage in Calistoga. 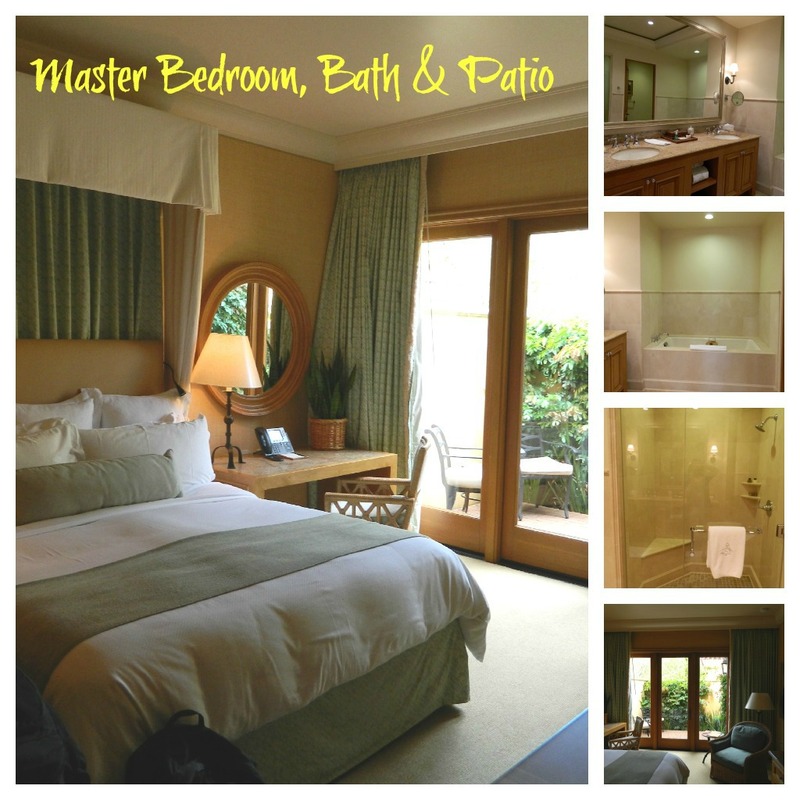 This trip was to The Resort at Pelican Hill in Newport Beach. 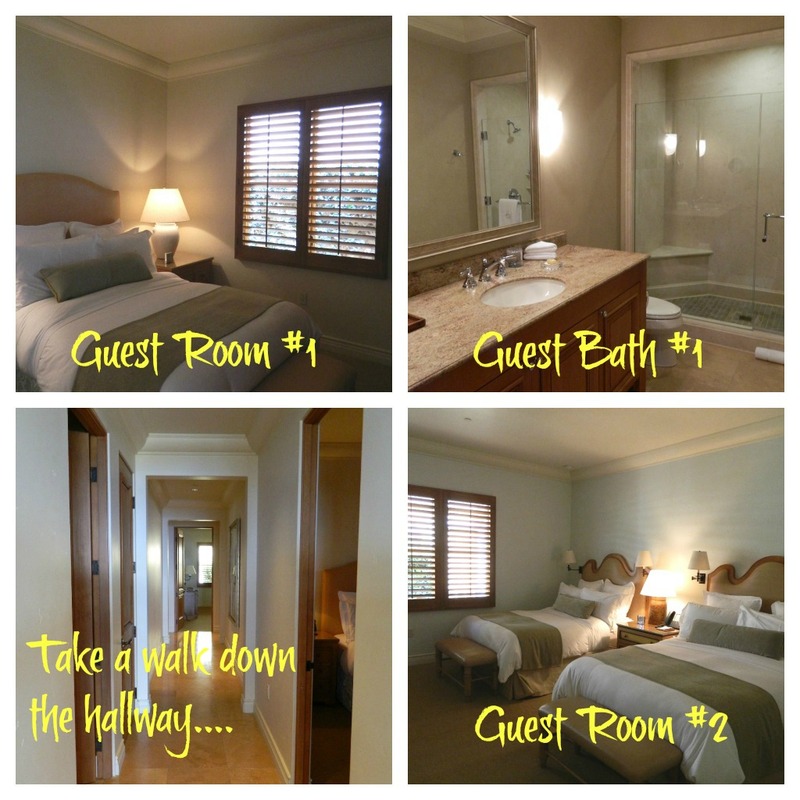 Now, if this trip wasn't amazing enough, something even more amazing occurred: the resort called and bumped all of our "regular" hotel rooms to villas. I say "regular" because their hotel rooms are not regular by any standard. 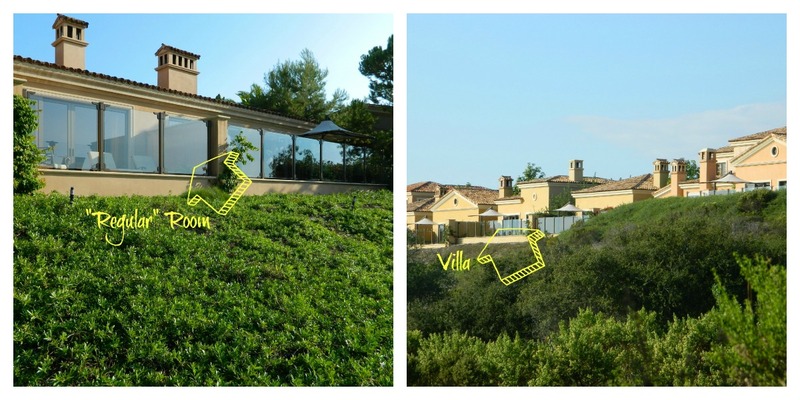 But a villa? 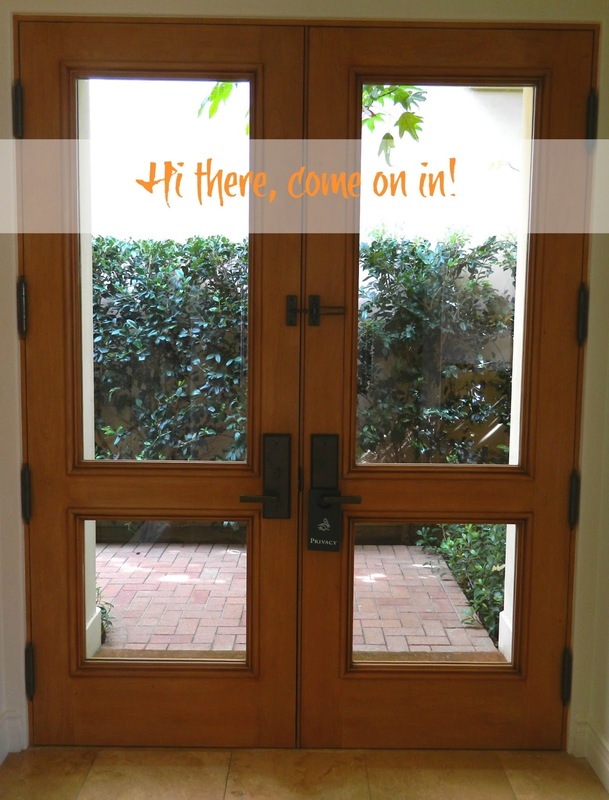 We're talking about 3,000+ square feet, 3 bedroom, 3 bathroom, full kitchen awesomeness. No bigs. No bigs?! That's funny. It was more like "Wait. We actually get to stay here? Like, by ourselves?". Less cool was the cheap as they come economically friendly rental car we were driving. Driving that car revealed our true identity of those-who-do-not-belong. Thankfully we had a two car garage with our villa to hide our car in. Yes a garage! Oh yeah, did I mention we also had a butler? I am so not kidding. We secretly wondered to what lengths could we request items. Hello this is Mrs. Oliver in Villa 32. I would like a bowl of green M&M's please. I kind of wish I would have tried this. The patio and views were amazing. I could have sat out there all day. But why do that when you have a pool that is like 3 football fields wide? I took the opportunity to make us a nice breakfast to enjoy on the patio one day while we watched golfers and read the paper. I wish the saying, "Let me make us a nice breakfast to enjoy on the patio while we watch golfers and read the paper" was something out of my normal life. Real talk: It is more like Did you feed the dog?What do you want for dinner? The car needs an oil change. Of course being in Newport we had to spot at least one celebrity right? We did. He was in fact, our villa neighbor, just down the road. The Lamborghini and Range Rover in his driveway was kind of a giveaway. Not to mention the hundreds of boxes of Nike's stacked 4 high in his garage. I will give you three clues: (1) He is a Laker, (2) He is tall, (3) His name starts with a K.
The grounds of the resort are really fabulous. It's hard to believe the place is fairly new; whoever did the planning and landscaping did a wonderful job. No matter where you go it doesn't really feel overcrowded or resort-y. Just relaxing and comfortable. But oh, those views. I think the patio and the views were my favorite part of the trip. Other than spending 4 wonderful days with The Cyclist, that is. Well, it has been nice daydreaming with you. When we take another break from reality, I'll share our day trip to Crystal Cove. Until then, have a beautiful daydreamy kinda day. How's that for some Pinspiration? I saw this on Pinterest and knew I had to try it. I learned a couple of things from this recipe. 1. Fresh coriander is cilantro. Who knew? I didn't. 2. 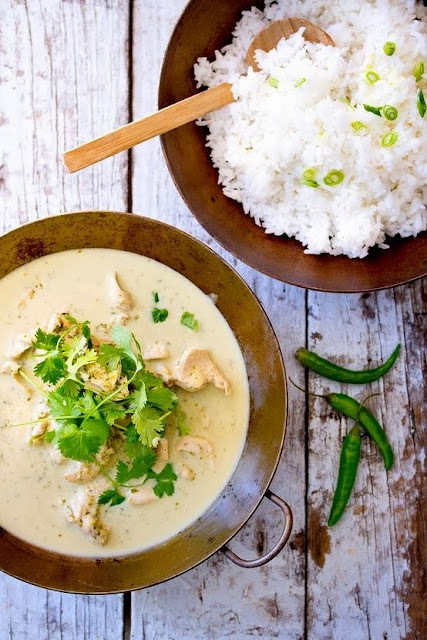 If I knew it was this easy to make green curry, I would have been making it way longer than this! Food Fox calls for 1 can of coconut milk but notes that for a thicker sauce, use coconut cream. So far I've made this twice, once with coconut milk only and the second time with 1/2 coconut milk and 1/2 coconut cream. 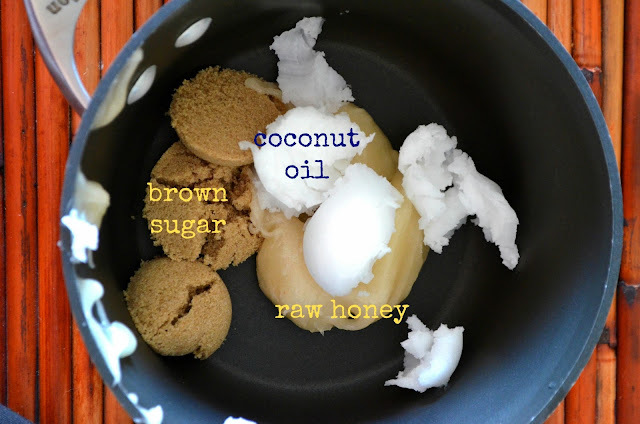 When I make this again, I will be using all coconut cream. I like the sauce thick and in my opinion that is the best way to achieve it. 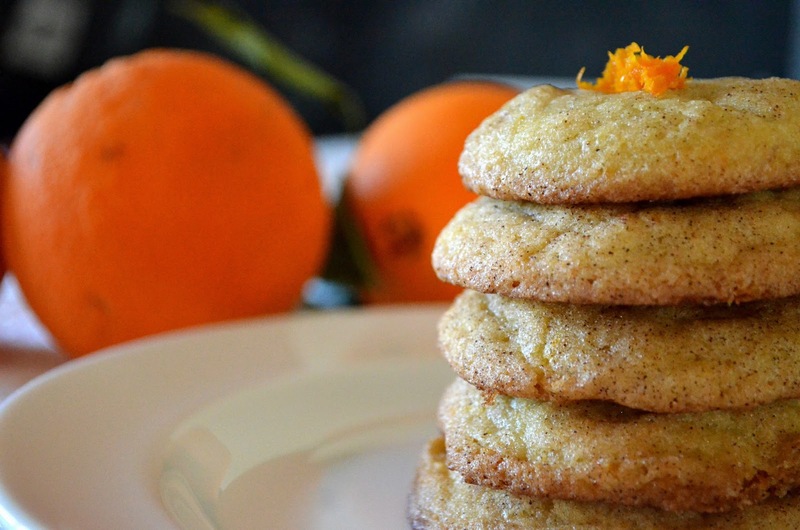 This is a great recipe that can be made fairly quickly after a day of work. It can also be easily changed around to add more veggies, tofu or whatever else you may like. I added eggplant for one of my tries and it was really good. For the full recipe click the link below the picture. Hello everyone. Orange you glad you stopped by today? Oh my. That was terrible. Let's start over. Hello everyone. Do you remember those 50/50 bars the ice cream trucks sold when we were kids? You know, orange Popsicle on the outside, cream in the middle.....or was that a Creamsicle? I don't remember. I do remember eating like 4 of them at one sitting and completely denying to my mom that I did it. Sorry mom. They were just so good. They were also like that orange/vanilla ice cream you used to be able to get. The kind that came in a block carton and looked like a checkerboard on the side. Did you know they don't manufacture the block cardboard ice cream cartons anymore? At least we can't get them here. I went looking and the grocery guy told me they are all round now. Weirdly, all this talk of 50/50 madness is reminding me of a Garfield beach towel I used to have. 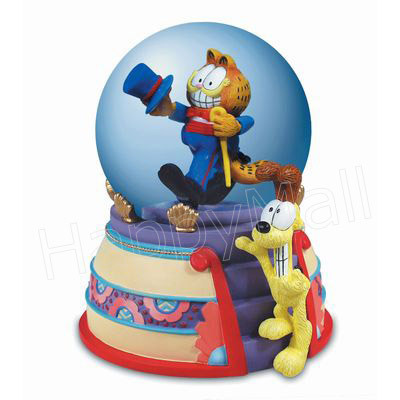 It had Garfield all decked out with top hat and taps. I thought it was extremely cool and my brother thought I was a big nerd. I just couldn't understand why he didn't think that towel was *SO*COOL* like I did. In weirder news, apparently my brain associates all things orange into one category. Garfield, 50/50 bars....you know, all that stuff. This is totally normal right? 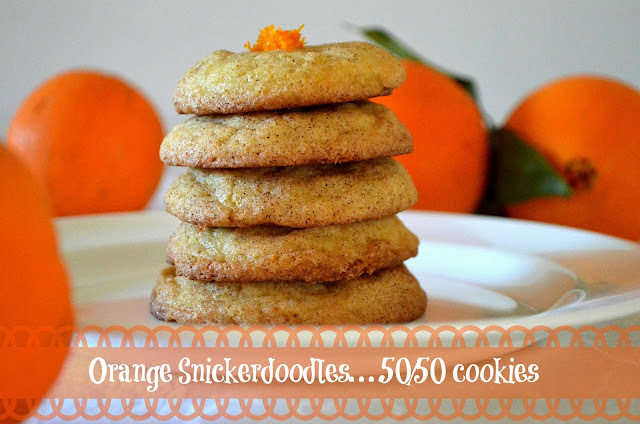 Anyway, these cookies are like all that 50/50 stuff. There is something so right about orange and vanilla. Wrapped up in a snickerdoodle package these sure taste good. This recipe is adapted from BHG's snickerdoodles. Add baking soda, cream of tartar and zest of 1 orange and mix well. Add flour in parts until it is all combined. Cover dough and chill in refrigerator for 1 hour (or freezer for 20 minutes). Combine 2 tablespoons of sugar and cinnamon in a flat bottom bowl (or a pie pan). Roll dough into 1 inch balls, then roll in cinnamon sugar mixture to coat. 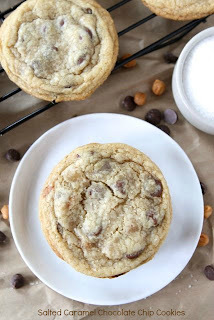 Place on ungreased cookie sheet and bake for 10-11 minutes. *I know I know. You're supposed to use unsalted butter in baking. For the most part I agree. 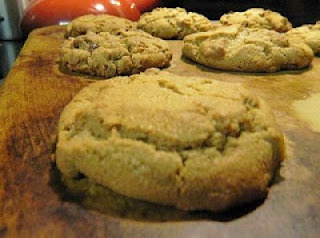 But, in my humble opinion snickerdoodles need salted butter otherwise they turn out a bit bland. So there. 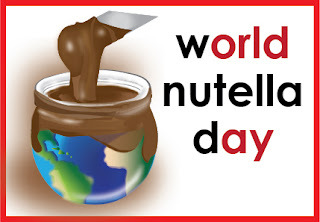 That's right friends, today is World Nutella Day! Yum! I know. My photo is terrible. But it's only because we ate them so fast! They are a perfect way to enjoy World Nutella Day. So go get your Nutella on! Some things are not as pretty as others. It's a fact of life, I suppose. But just because something is not as pretty on the outside doesn't mean it's better on the inside. The oranges on our tree are a good example of that. They aren't shiny and perfect like store bought oranges. They aren't all the same size either. But oh those oranges! They are the best oranges. So good in fact, I'm willing to sit here and say I will never buy a grocery store again as long as I have that tree in my backyard. 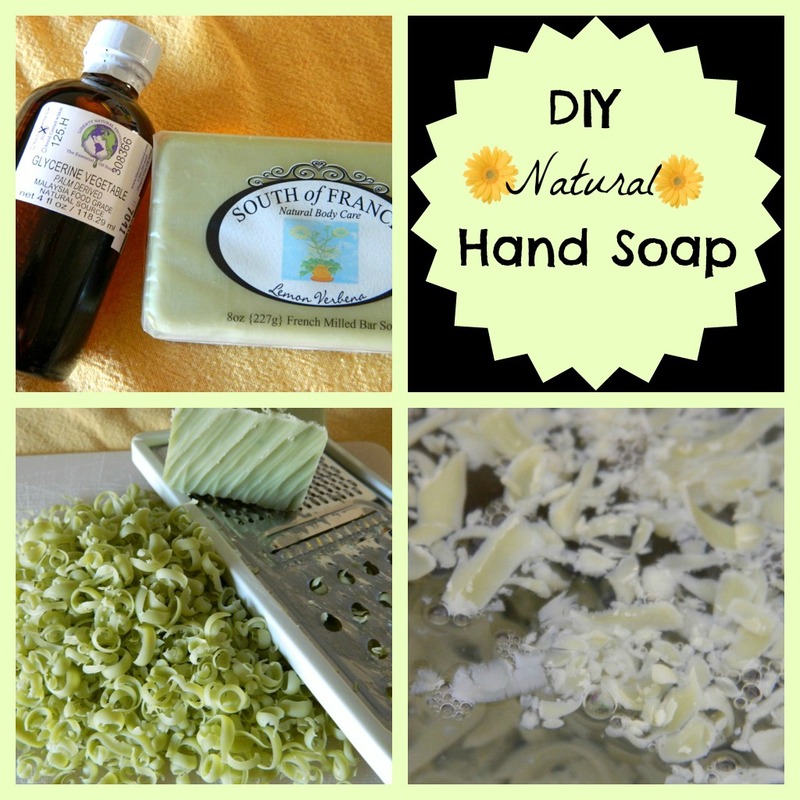 This DIY hand soap is another example. When I saw it on Pinterest I was intrigued. A gallon of Mrs. Meyer's for about 5 bucks? Well OK! So what if it's in a recycled milk carton, right? Beyond being less than $5 for an enormous amount of soap, I also liked the fact that it was not anti-bacterial. Why is all of the soap anti-bacterial now? We prefer to not use anti-bacterial soap for a variety of reasons, most of which are noted here, but also because, it's just really not necessary all the time. Unfortunately, I could not find Mrs. Meyer's in the bar form in my local area. Instead, I headed to the co-op to see if I could find a way to make this recipe in an even more natural way. I found a yummy smelling lemon verbena soap ($3.99) and a vegetable glycerin (about $3) in the co-op's beauty department. The helpful beauty lady told me the vegetable glycerin is a natural version of the liquid glycerin used in the recipe from Pinterest/The Farmer's Nest. Another nifty thing about vegetable glycerin - you can add it to your everyday moisturizer to make it into a winter moisturizer, pretty nifty. P.S. Either "glycerine" is spelled wrong on that bottle or my spell check (glycerin) is wrong - you choose! The Farmer's Nest says it has a snot-like consistency. This is kind of true, but I found it has set up a bit better over time. It does work just fine though. If you re-use a plastic soap container (like I did) it kind of sticks to the sides. This is really not a big deal and could be easily fixed by buying a ceramic soap dispenser. I've just spent years paying too much for liquid soap so I don't have one. The sticking-to-the-side phenomenon is nothing crazy either, it's just that you can see some soap residue on the clear container. No bigs. Sometimes you have to shake it. I noticed this more when I first made it, but not so much anymore. This soap smells GOOD. Plus, you can make it smell like whatever you want - have fun picking out your bar of soap! The find on vegetable glycerin was worth it alone. My skin looks really good even with dry winter air, but the soap is great too. You still get a gargantuan container of soap for like $5!! Add 2 Tablespoons of vegetable glycerin. 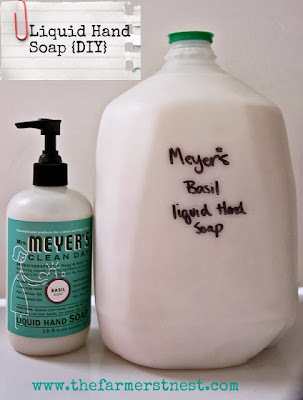 Turn your heat to medium high and stir frequently until soap dissolves. At this point I transferred mine from my good big pot into a couple of old big bowls - this step is optional. Let the soap cool for 10-12 hours. After it is cooled completely it will harden. At this point mine was pretty hard, like thicker than normal Jell-O. So, if yours is like mine was, get out your beaters and add a little bit of water* at a time while blending until you reach the consistency of liquid soap. *Because I added water I ended up with more than a gallon. You know what you put in it!